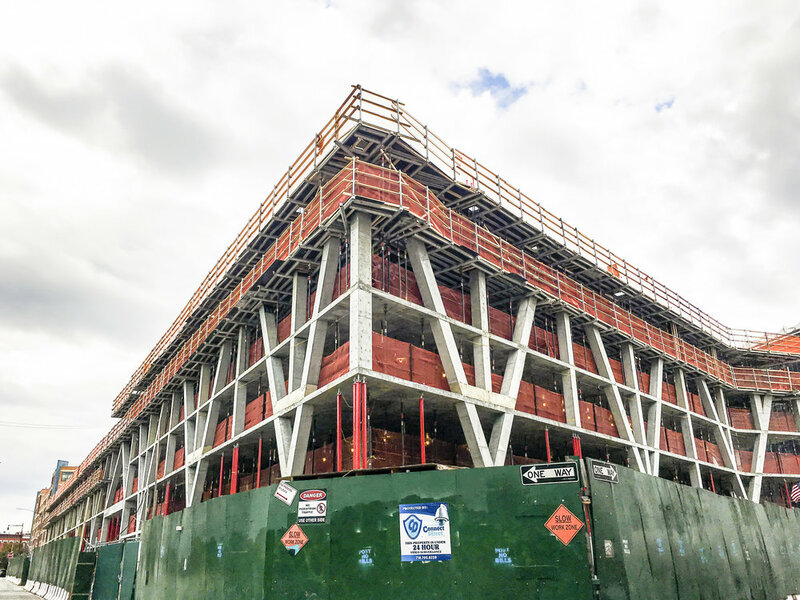 This unique project located along the East river featured very challenging cantilevered protrusions randomly located throughout both projects. These features required tall shoring over 70’, capable of supporting multiple levels until the building was complete. 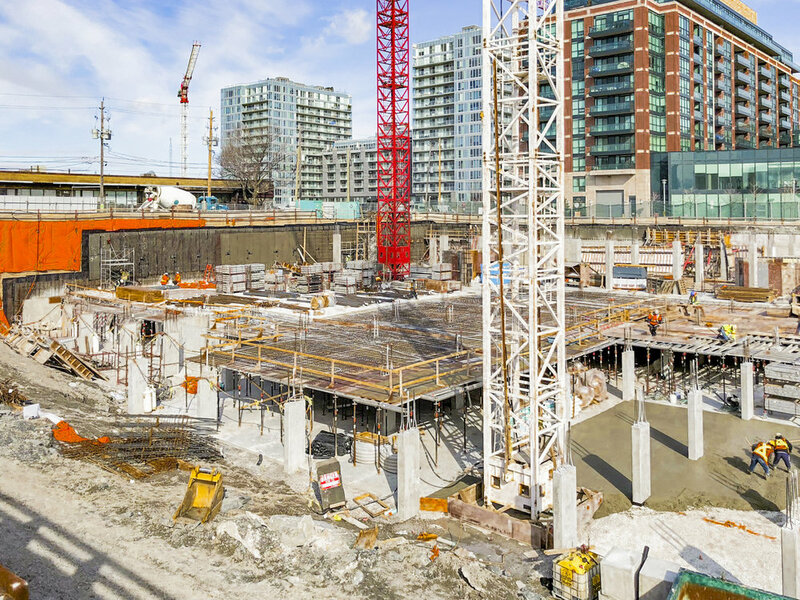 TITAN’s engineering group deployed the TITAN MAX 20K shoring system to accommodate the tall shoring/high capacity areas. The TITAN HV modular shoring system was used through the building because of its flexibility and efficiency. This remarkable structure located in Toronto’s financial district featured twisted/rotated floor plates in the tower supported by a massive 4’ thick transfer slab at the 5th floor further supported by 4 commercial levels and “corkscrew” style underground parking below. 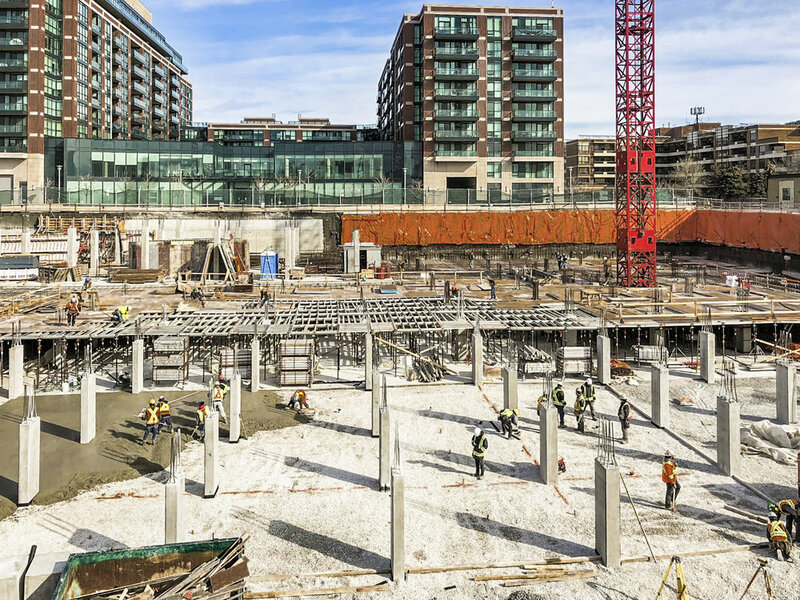 TITAN’s engineering group designed the lower levels with the TITAN HV shoring system to meet the challenges of the two-way sloped parking areas and complicated commercial floors. 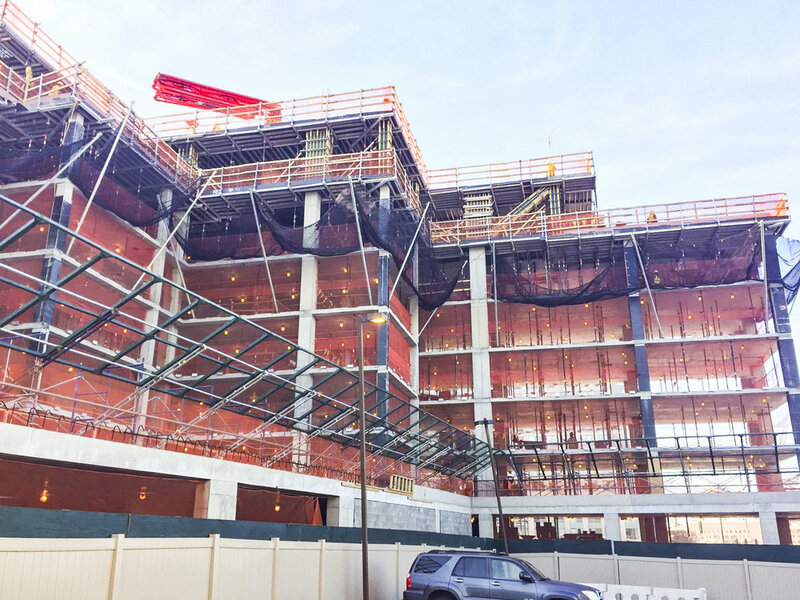 The transfer slab was shored using TITAN’s Alu 11K shoring frames in conjunction with TITAN’s XL350’s reshores. 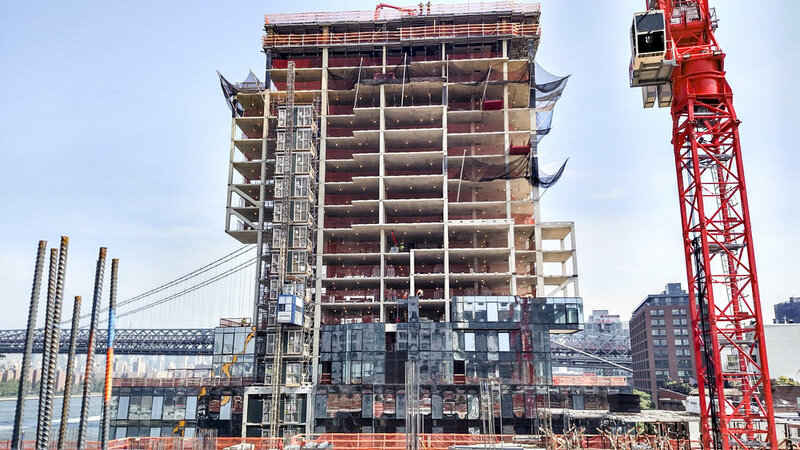 This high-rise residential building located in Long Island City utilized TITAN HV shores throughout the 25 levels encompassing 307,000 sq. ft. 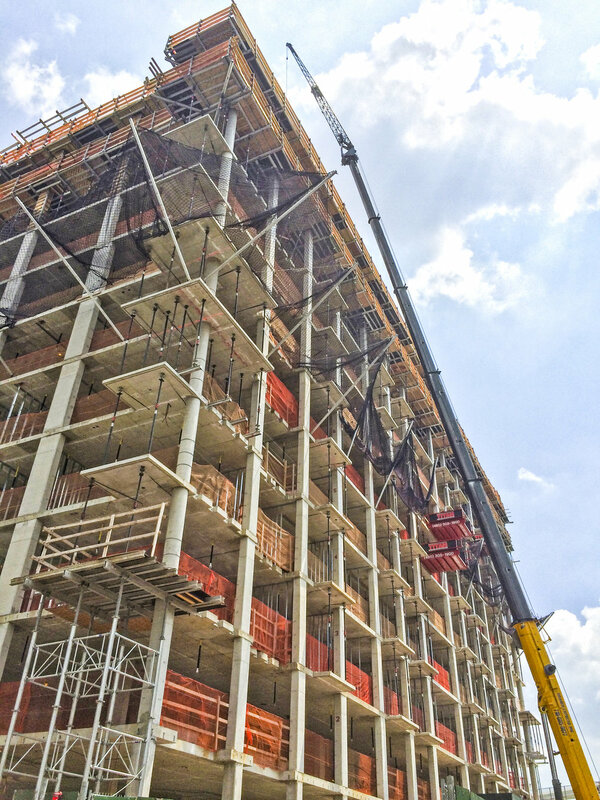 The outrigger platform was used to enable efficient material handling with a crane. TITAN’s engineering team skillfully crafted an efficient layout for this 507,000 sq. ft. mixed-use tower. Deck height was varied in order to accommodate the different intended uses for this building. 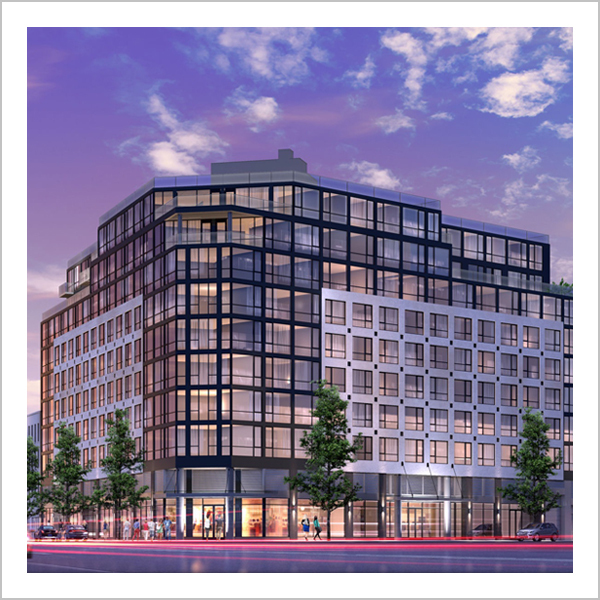 This 11-story apartment complex with commercial space on the first floor optimized the use of TITAN HV shores and beams to build this unique v-shaped space. Builders also used the TITAN OP to deliver supplies to each floor safely and efficiently. 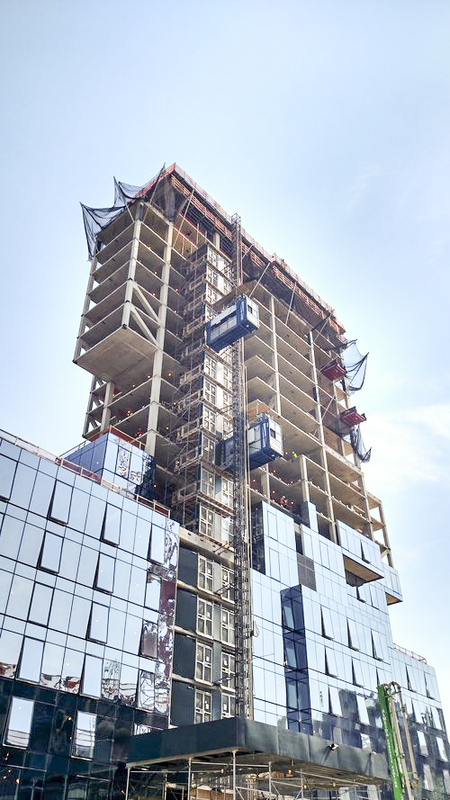 This 615,000 square-foot, 22-floor, mixed-use building containing 406 residential units, 66,000 square feet of retail space, and four levels of below-grade parking was perfect for our TITAN HV and TITAN XL systems. Our engineers were able to easily adapt our shores to the varied floor heights and cantilevered balconies. 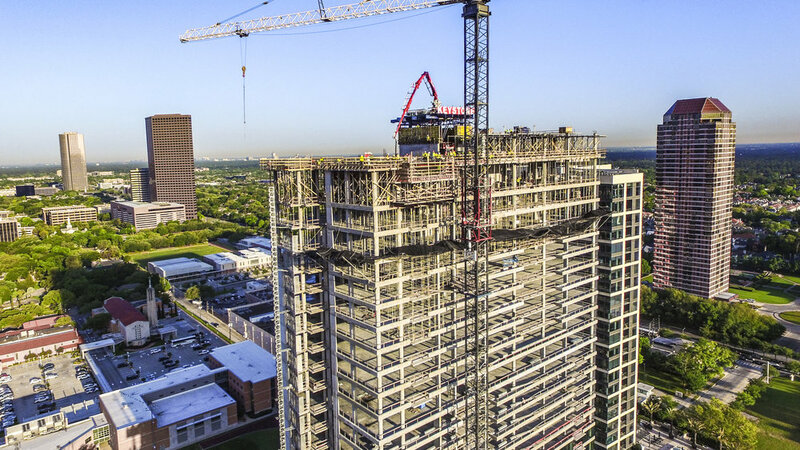 TITAN engineers were challenged with a wide spanning slab that demanded 200,000 square feet of shoring between the first two floors. The ground floor boasted a transfer slab that was 1.2 meters thick and 5.5 meters high. TITAN’s #5 shores were used with two supplemental shores for each main beam spaced out 6” to 8”. By the completion of the second floor, over 8,000 shores had been utilized with 22,000 secondary beams on site at any given time. 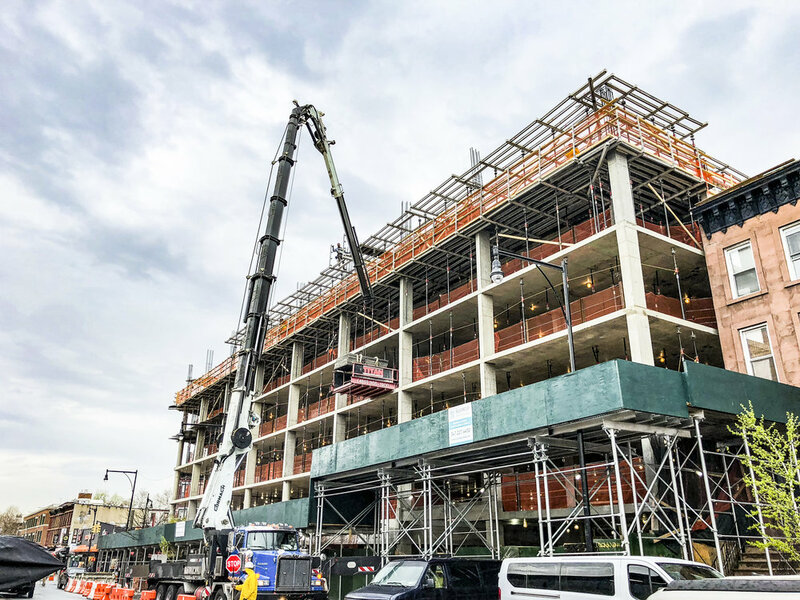 This sprawling project in Brooklyn featured architectural angled columns at the perimeter causing floor to floor shoring variations and unique conditions that were easily and safely accommodated by the TITAN HV modular shoring system, allowing the contractor to meet the aggressive schedule.